Like standard-size business cards but still want something a little different? Try rounded corners. With rounded corner business card printing, you don't lose the space of a smaller die cut and with only a simple, minimalist design you can still achieve a classic look. This elegant look is recommended for a wide range of industries including restaurants, real estate businesses, graphic designers, and creative professionals, health businesses, fashion professionals, and photographers. They’re also popular for science and technology startups as well as for personal use. 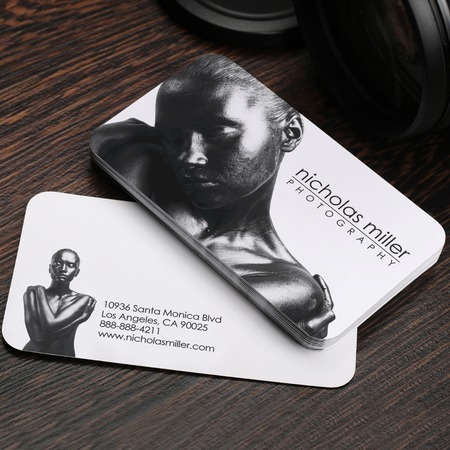 These rounded corner business cards are printed in the standard 2” x 3.5” dimensions on a 14 pt. cardstock with a gloss, matte, or high gloss coating. Print from 25 to 10,000 business cards and have them ready for shipping in 2, 4, or 6 business days. If you'd like to see a list of available business card shapes for printing, please click here.